Rick Pitino met with the media today and kinda-sorta addressed the Karen Sypher extortion case. Naturally, talk turned to 9/11. 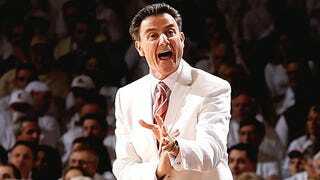 "My job is to focus on the University of Louisville and the basketball program," Pitino said. "And I've got to do the best job. Times aren't easy, but I'm not going to lie to you and I'm not going to talk about it. Times aren't easy, but if I can get through 9/11, I can get through anything in my life. And I got through 9/11 and there's nothing ever going to come close to that. We'll get through this in a positive way and move on. Well, it's not the first comparison to spring to mind, but it's not an idle one, either. Pitino's brother-in-law and best friend, Billy Minardi, was a bond trader at Cantor Fitzgerald who died on Sept. 11. She doesn't have a job and has taken to going to Mass every weekday morning. Except when she has to pick up her children from school, she stays home and out of sight, dreading the next time she might end up on the front page of the newspaper. Karen Cunagin Sypher, a 49-year-old former model and auto glass saleswoman accused of trying to extort Louisville men's basketball coach Rick Pitino, says she feels shunned. "I feel like I'm in a horrible movie that is just ... ," she said, trailing off during an interview in the office of her attorney, Thomas Clay. "I was set up from the very beginning and I'm still being set up and I am going to prove my innocence." Cunagin Sypher said she fears Pitino's popularity and clout in a basketball-crazed city means she'll be sent to prison. She said she is considering applying for food stamps, and choked back sobs while vowing she will not give in. "Do you back down? Do you show your children that the justice system doesn't work?" she said. "Or do you show them that it does work?" The trial is set to begin later this month, but for now, at least, the case is being tried in the realm of our sympathies. For whom do you feel sorrier: The guy who lost his friend in 9/11, or the shunned single mother who may have to go on food stamps?